You know how Greek heros like Hercules had quests? Well my quest is to find the perfect smokey purple eyeliner under $5. Is it that unreasonable to hope that there is a beautiful plum out there, slightly shimmery but not too much smokey grey in it? Is it also too much to ask that this eyeliner stays on all day, doesn't smudge and happens to be waterproof? I bought 3 different liners, and tested them out. The first one is from e.l.f., I bought for a dollar. Now usually when I review a product, I leave a bit of room for the possibility that I might be wrong about a product and let the reader decide if it's worth the investments. This isn't one of them. This product is the single worst cosmetic purchase I have ever made. It's hard to draw a line with it- sure, it performs well when you draw on your hand, but when you actually use it on the eyelid, it tugs the skin quite a bit. At the same time, it's greasy feeling and fades off right away. Completely rubbish for an eyeliner. 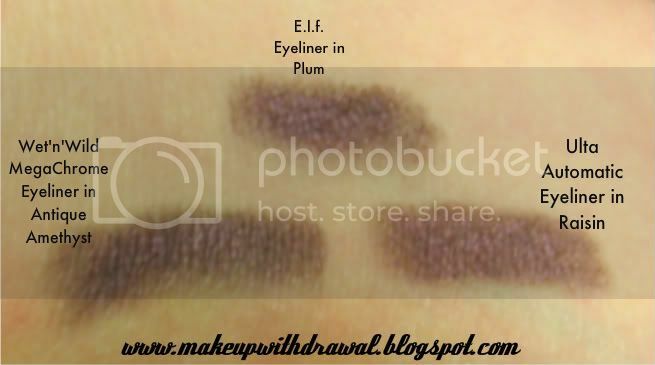 I tried to salvage it by using it all over my eye lid as a dark base. What a mistake! The next morning, I woke up with whiteheads on my eyelid. Whiteheads! Eyelid! The next one, which is a step up (barely) is the Wet'n'Wild MegaChrome Eyeliner in Antique Amethyst. This one was about $2 dollars when I did a BOGO free with WnW products at Walgreens. It still was rather dull but this one was definitely creamier and didn't make my eyes break out. My favorite one so far is the Ulta brand Automatic Eye Liner in the color Raisin. It's got great color yet I think the most appealing part is the waterproof qualities- once you apply this liner, it stays. No little purple rainbows even if your eyelids are greasy. The best part? I bought this at Ulta for a dollar during one of their sales (normally $7). So it is indeed to find a spectacularly pigmented eye liner in an interesting color that is still cheap. I highly recommend waiting to purchase colored eyeliners when there's a sale of some sort going on (no matter the brand- anything from high end cosmetics to drugstore makeup), also keep in mind the return policies- I like buying from places that let you return used makeup for any reason at all (it's why I love CVS! ).